Nolco-Flex is made from a soft wood fiber board which becomes an endless track because of the parallel grooves and double-sided lamination. It is manufactured in widths of 100 to 2,400 mm and offers great flexibility in the required length by simply cutting between the lamellas. 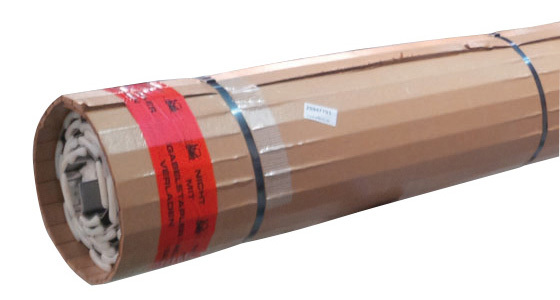 Because of its elastic shape retention properties, Nolco-Flex is a proven product as a protective packaging of goods of different shapes and sizes. Depending on the quantity, all Nolco-Flex types are available with individualized color or printing on the outside liner.